Over the years I have read some pretty far out stuff. I think I've commented previously on the late Dr Abram Hoffer's use of B3 for controlling schizophrenia. Interesting and a source of thought trains which I never got the time to follow through. What I personally enjoyed were the accounts of recovered schizophrenics as to what it was like to have been inside the syndrome and then recover. Re-reading the site, it all looks very anecdotal now. I also went so far as to purchase his book, written in conjunction with Linus Pauling, on treating cancer with vitamins B3 and C. You can just google the ISBN number 18970251141897025114 to find out a bit more about it. I see it's quite financially valuable nowadays! Before we settle down to the nuts and bolts of the deeply involved models which the latest complex I paper (thanks George) used, the bottom line is that adding 1% nicotinamide (similar effects could be obtained with vitamin B3) to the mouse breast cancer models was very impressive at extending lifespan of those mouse models, especially through suppression of metastasis. I find this slightly eerie. I can hear Hoffer in my head, sounding rational and being regarded as a quack for treating cancer (and many other illnesses including schizophrenia) with B3. Yet here are these guys in 2013 with their multiple mouse models, multiple tumour types, multiple interventions all showing that B3 or its analogue is very, very effective in suppressing breast cancer metastasis. In mouse models of course. A lot more to say about this paper but the B3 aspect is just so weird I had to put this aside up. This is the paper where the gene for TFAM was knocked out in the adipocytes of some mice. Edit: Thanks to Purposelessness for the link through comments, end edit. Two consequences of this appear to be that complex I doesn't seem to be there and that complex IV, while present, doesn't seem to be up to much either. With a large chunk of their adipocyte ETC disabled these mice seem to be a little stunted overall but they stay slim and simply refuse to develop insulin resistance with either age or with the feeding of a ton of sugar, described throughout as a "high fat" diet, good old D12492. Don't snigger, this isn't funny! 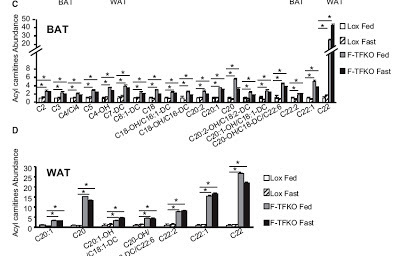 If you have just come from Kushnareva et al's paper on complex I you could just ask whether the FeS complex N-1a is present or absent in these mice, but then you hardly need to ask this because the mice don't become insulin resistant, ie they don't generate superoxide at N-1a, even though the adipocytes have increased lipid and DNA damage, probably through them spewing electrons at complex IV. So there's really no need to trawl back through the layers of refs to the development of this mouse model to know that there is no FeS cluster N-1a. Or certainly nothing feeding electrons to it. If there were, there would be insulin resistance... I find this difficult to get excited about, useful though it is. But the paper is utterly fascinating in several other ways. I went through the results to Fig 6 where TBARS and 8-OHdG are shown for D12492 fed mice, being surprised that no damage was reported when the mice were fed crapinabag (this is not quite as true as it sounds but, again, it's not important here). Not so good for D12492 feeding of course. Moral: Don't eat toffee fudge as your sole diet. There is a great deal else which could be said about free radical damage in these mice but that's not for today. Of particular interest to me was the rather high relative abundance of activated (carnitine linked) behenic acid, C22:0, over on the far right of each chart. 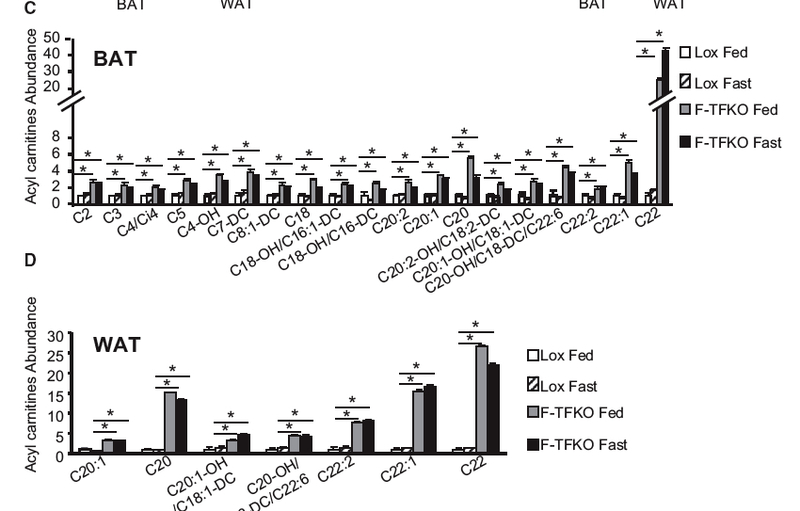 Now bear in mind that there is not a lot of C22:0 in the fat of normal mice anyway, so the massive relative abundance may be, in part, an artifact of a rather low level of C22:0 in control mice. But there is probably a lot more in mice with a crippled ETC. Behenic acid is fully saturated, it's long, it's F:N ratio is as close to 0.5 as you can get and it should be rapidly degraded in peroxisomes. 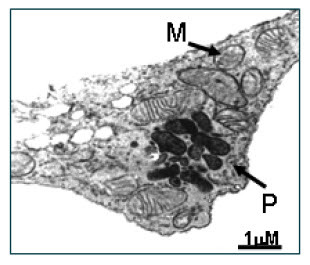 But these mice have markedly down regulated peroxisome promoter genes and the organelles shown in the photomicrograph look, apparently, pretty crappy. So let's have a think about how this might fit together. These adipocytes have no complex 1. What can you do with NADH in mitochondria if there is no complex I? Diddly squat is, I think, the correct term. Glycolysis works fine and generates a smidge of ATP by substrate level phosphorylation. And some NADH too, which is of no use what so ever. Complex II, succinate dehydrogenase, is fully conserved and can feed in to the CoQ pool to run the ETC, the abnormal complex IV doing the best it can. No matter how much the CoQ pool is reduced there will be no reverse electron flow through complex I because complex I ain't there. But running from pyruvate dehydrogenase through the TCA to succinate dehyrogenase generates 3 utterly useless NADHs and completing the TCA gets you yet another NADH. What's a cell to do? Well, it can start by generating a ton of pyruvate by glycolysis. These cells do have a lot of pyruvate. You can feed this in to mitochondria and through pyruvate dehydrogenase (or even pyruvate carboxylase, see below) then generate citric acid from oxaloacetate. If you really don't want to generate more useless NADH than you have to, then why not export the citrate to the cytoplasm through the malate shuttle and convert it to long chain fatty acids? Fatty acids only half-care about putting NADH in to complex I. They will, of course, generate some NADH but what they also do, which is really useful, is to generate FADH2 within electron-transferring flavoprotein which can be used via electron-transferring-flavoprotein dehydrogenase to reduce the CoQ pool, without all of that cyclical messing around with the TCA. And without any need for complex I of course. As we know, the longer the saturated fat the more FADH2 it generates per unit NADH. These cells desperately need FADH2 input to reduce the CoQ pool. A 22 carbon fully saturated fat is a good option. Behenic acid. Peroxisomes are NOT wanted, it's FADH2 to CoQ all the way. Of course as acetyl CoA is taken for fatty acid synthesis the citrate yields malate again which, if it re enters the TCA, will give another useless NADH as it converts to oxaloacetate. So why not convert the malate back to pyruvate (replacing the NADPH used to generate that malate) and then use pyruvate carboxylase to generate oxaloacetate without the obligatory NADH resulting from when malate is converted to oxaloacetate? You can then allow citrate regeneration which can be re-exported to cycle around through more FFA generation, yielding usable FADH2 again. 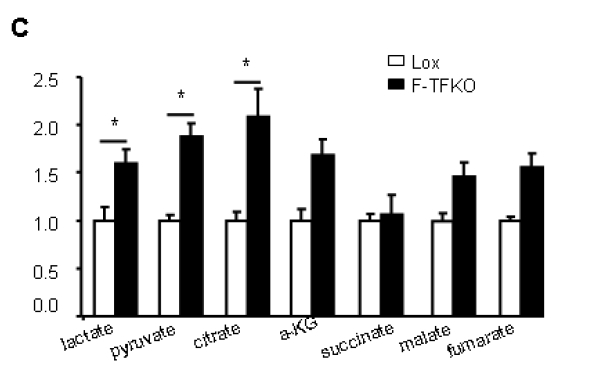 Looking at Fig S6 from the supplementary data we can see that, of the TCA metabolites, only citrate is significantly increased. Pity they didn't measure oxaloacetate. Pyruvate is increased as you might expect. Glycolysis really needs to be generating NADPH (pentose phosphate pathway) for fatty acid synthesis but I can't see from the paper if this might be occurring. I think it's a reasonable assumption that it is, because the behenic acid is not coming from the diet and NADPH is needed for the fatty acid synthesis which generates it in-situ. There is plenty of lactate derived from the excess of pyruvate over what is needed by the crippled mitochondria. I also can't tell from the paper how much the glycerol phosphate shuttle is up regulated to feed in through it's own FADH2 route to reduce the CoQ couple either. I suspect it's rather active. Anything which inputs to the CoQ couple other than complex I seems to be essential for these cells to survive. The impression I get is of adipocytes which are simply converting glucose to fat and running on a (genuine) high fat diet at the mitochondrial level, despite the oral diet being crapinabag. The photomicrographs of the mitochondria doing this show that they look pretty sick, but what would you expect with a big chunk of the ETC missing? Interestingly there are a number of quite severe complex I deficiency mitochondrial diseases in human clinical medicine. Current management is with a high fat diet, hats off to the clinicians for this. Somehow I doubt that sucrose is classified as a fat for these poor folks! Overall, nice adipocytes. It still looks to me as if the F:N concept is essential for getting any sort of an idea of what might be going on in this type of model. Protons: Where is FeS cluster N-1a? I picked up this paper from one of Nick Lane's books, can't remember which one but probably PSS. The paper itself is very, very interesting and delves deeply in to redox potentials, especially within the iron-sulphur centres of complex I, to the sort of level which is way beyond my ability to critique. So I'm accepting their findings pretty much as presented, with the usual caveats about mitochondial studies. In particular it worries me that we can study superoxide generation in mitochondria at partial pressures of oxygen around 100mmHg (room air). No mitochondria see this concentration of oxygen in vivo. 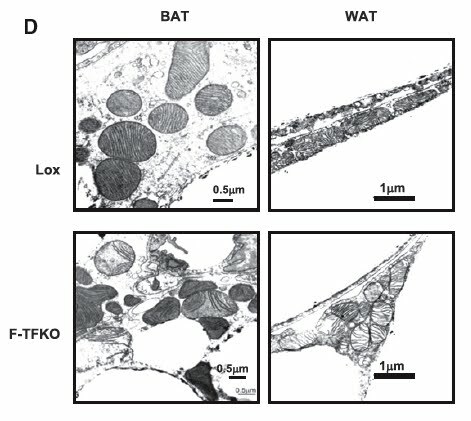 The group make a pretty good case that the FeS centre N-1a is the primary source of superoxide generation from complex I when mitochondria are being fed on NADH generating substrates, in particular when there is a large excess of NADH per unit NAD+. It also appears to be the source of superoxide under succinate driven activation of complex II, probably secondary to reverse electron flow up the FeS clusters secondary to markedly reducing the CoQ couple. The group didn't look at activated fatty acids but the F:N ratios would suggest to me that palmitic acid and upwards (chain length of fully saturated fats) would behave much as succinate does, by reducing the CoQ couple in a very similar manner. I've argued for some time that superoxide is the physiological switch to turn off glucose metabolism (ie trigger insulin resistance at the individual cell level) when generous levels of saturated fats predominate for oxidation. 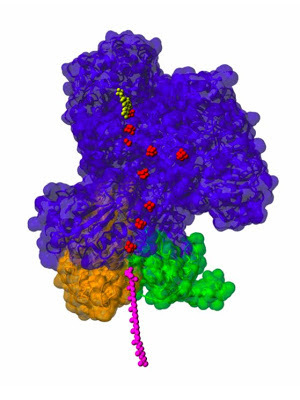 Look at the string of FeS clusters, shown in red, running through the protein bed. Cluster N-1a is the one right adjacent to FMN, probably set behind it rather than as close as it looks. The one off to the right is N7. Modern complex I almost certainly never originated as a proton pump but its deepest ancestor rather looks to have been a layer of iron pyrites, FeS. 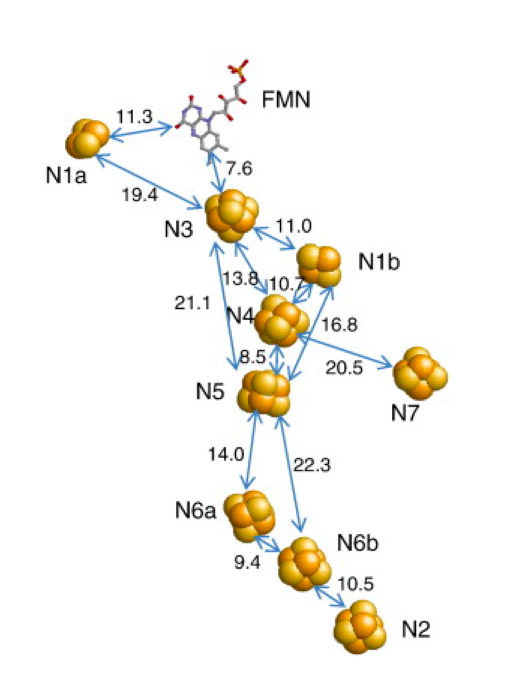 Up at the top of the picture, in yellow, is the flavin mono nucleotide which transfers electrons from NADH to the FeS chain. At the bottom, in pink, is ubiquinone of the CoQ pool, ready to transfer electron equivalents to complex III. 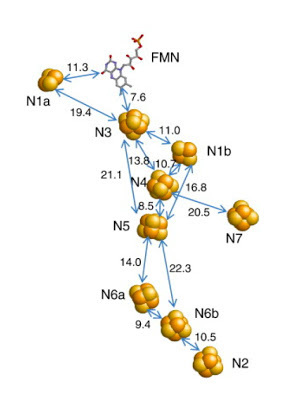 The CoQ pool is fascinating as having it reduced (in this paper by supplying succinate to complex II) appears to cause reverse flow up the FeS chain as far as (and perhaps beyond) the side branch to N-1a, with superoxide generation as the result. Palmitic acid probably does the same but obviously reduces the CoQ pool using electron-transferring-flavoprotein dehydrogenase (which lacks a catchy name) rather than succinate dehydrogenase (complex II), as we've discussed previously. Both NADH and CoQ move electron equivalents around on a macroscopic scale by moving physically. The FeS clusters shuttle electrons by quantum tunnelling. This is a very short distance phenomenon. Below are the sorts of distances between the various FeS clusters in complex I. If anyone thinks the arrangement of FeS clusters is in any way a random set up I suspect they have no concept of what 4 billion years means. We can ignore the N7 cluster as it's not really in the FeS chain at all, being over 20Å out to one side and it is not highly conserved. Cluster N-1a is highly conserved but it too is not really part to the chain of FeS clusters. It also sits out to one side, about 11Å out from FMN. This is a perfectly reasonable tunnelling distance to transfer electrons to and from FMN, but to hand an electron on to the N3 cluster (and so to the rest of the FeS chain) is over 19Å, a relatively low probability electron transfer. So N-1a looks as if it might be functioning as a reflection of the redox state of FMN, which reflects the reduction of the NADH/NAD+ couple. With a highly reduced NADH/NAD+ couple there is a spare electron on N-1a just waiting for an oxygen molecule to convert to superoxide and signal "no more" at the macroscopic (cellular) level... It will be interesting to see how this message is carried from N-1a to wherever it affects cell function but for the time being it's the superoxide generation which I find interesting per se. This gives us a nice view of complex I and N-1a linked superoxide generation which sets us up to look at what happens when you destroy complex I by growing mice with the TFAM gene knocked out in their adipocytes... Let's go there soon, if not next. Labels: Protons (20): Where is FeS cluster N-1a?